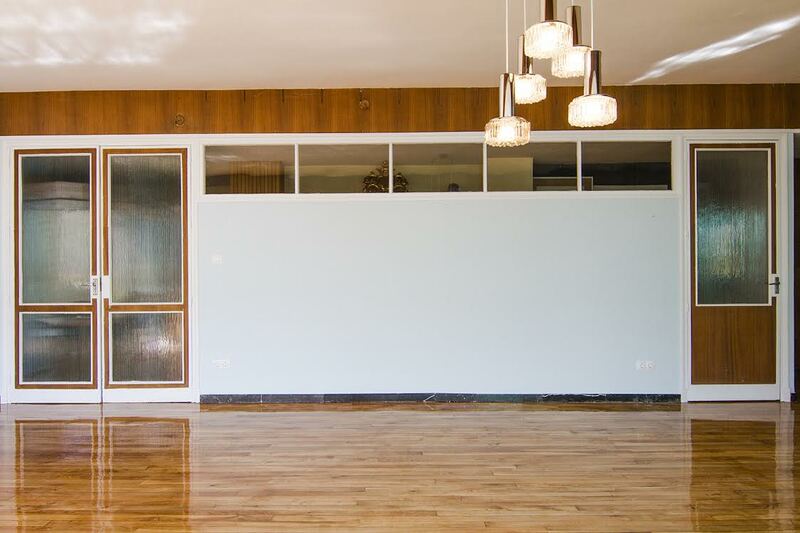 This living room in an apartment of Castile, finished in 1956, has been refurbished regarding modern movement conservation and its decoration details. The current owners were aware of the architectural value of the property and at the same time wanted to upgrade the comfort standards and sustainability maintaining the original style, colors, construction materials and lighting of the decoration of sixties, unusual in this area. Read this article here. The 1960s opened a new era for Spain after decades of autarchy: construction materials and specialized work craft were very limited. For this reason this original interior rich in details and construction materials, is specially valuable. 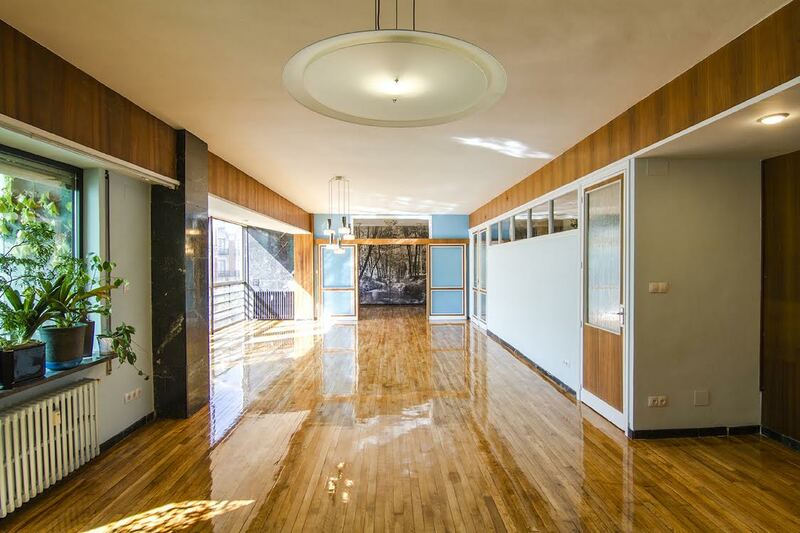 It is inside an apartment complex of the Modern Movement listed by the DoCoMoMo Foundation. In this case, however, the owners decided to maintain all the original ideas, construction materials, wall covering, indoor joinery and interior glass, colors and design details such as spotlights in the external and internal ceilings, lamps or door handles as a testimony of its time. The ten-floor building, from the architect Julio González, has a checkerboard facade that alternates openings and surfaces: shaded terraces are combined with glass curtain walls, as a new version of the traditional bay window. There is simultaneously a subtle play of colors between the black marble, local white stone and wood. The building itself included innovations of its time in appliances and facilities, such as a parking garage in the basement (the first in this city), a vertical waste collection service and a swimming pool on the roof, among others. The extensive use of natural stone such as local white stone and marble in different colors (black, yellow and green) is one of its specifically interesting characteristic. These were applied on the façade, the entrance hall, internal communal corridors and the park entrance. The application of those natural stones was meticulously modulated on big pieces. 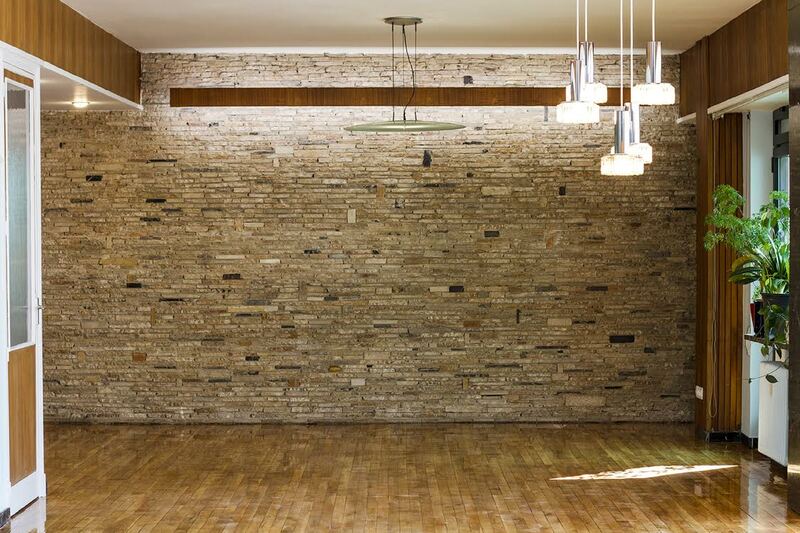 The heterogeneous cuts of the big pieces were used to form a miscellaneous layered stone-wall, used in the interior (Photo…), or as a tough and non-slippery floor in the garage entrance. The first decision was to improve the insulation of the façade in order to increase energy efficiency, substituting window frames (from U=5,7 to 4,0 W/m2K ) and window glasses on the terraces (from U=5,7 to 2,7 W/m2K). New electrical blinds were placed on the curtain wall. Mineral wool insulation was placed in the internal cave of lowered ceilings and thermal bridges in the bay-window were interrupted. With these actions the energy demand was reduced by 22%, according to design simulations. A specially delicate operation was replacing the electrical wirings. The original electrical cable line was set in the ceilings and walls, and was dysfunctional. In order to install new one with current performance and safety, without damaging the marble or reducing the free height of 2,78m, a careful installation was hidden along the track of the sliding doors and along the cave of the lowered wooden terrace ceiling. The deteriorated gadgets of the original Interior luminaries, lamps and exterior lighting were carefully restored. LEDS and low-consumption bulbs were placed in the original lamps: Taraxacum from Achille Castiglione, Nébula and a typical, five-armed glass ceiling lamp, original from the time when the apartment was built. Daylight is one of the best achievements of the apartment, due to its southern orientation and the design decisions. 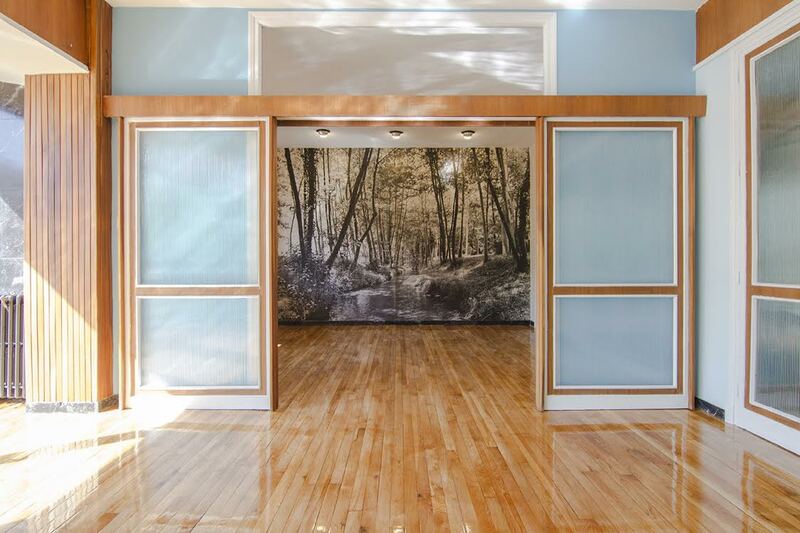 For this reason the original grooved translucent glasses in the Indoor joinery with fitted doors were maintained to provide daylight to corridors and halls without disturbing privacy. The internal doors, on white color, were delicately paneled with sheets of wood, as well as the lateral side of the ceiling beams. These sheets were carefully maintained, cleaned and restored. The facings (marble, stones, wood) were maintained in its fittings and fixtures, simply cleaned and some of them restored, but all of them are original. The walls were painted in the original (RAL 5012 and 3025). Special emphasis was done to identify and preserve the photograph-wallpaper covering one of the walls as it was a nostalgic testimony of sixties fashion. The main idea behind this restoration was to breathe new life into the room whilst respecting the heritage of this listed building, as part of an effort to increase sensitivity in the general public towards modernist heritage. All of its details have been restored: architectural disposition, cladding, joinery, hangs, spotlights… because all of them are proof of all-round design excellence. Just as good architecture, good conservation lies in the details.